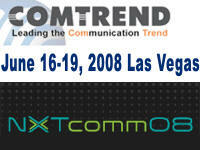 Comtrend will be attending NXTComm08, Booth #SU6426, Showcasing HD IPTV over VDSL2, ADSL2+ Bonded with Phy-R! Comtrend Corporation, a leading supplier of broadband customer premises equipment, will be attending NXTComm08, Booth #SU6426. Showcasing live HD IPTV over VDSL2, ADSL2+ Bonded utilizing both PowerLine and MoCA home networking technologies. Also presenting a live demonstration of Broadcom’s new Phy-R?technology to provide even higher video quality.